Our family loves spinach. We love growing it, and we love eating it. Living in Texas, we can usually only grow it in the cooler temperatures of the Spring and Fall. When our spinach is ready to harvest, we sometimes feel that we have it coming out of our ears! 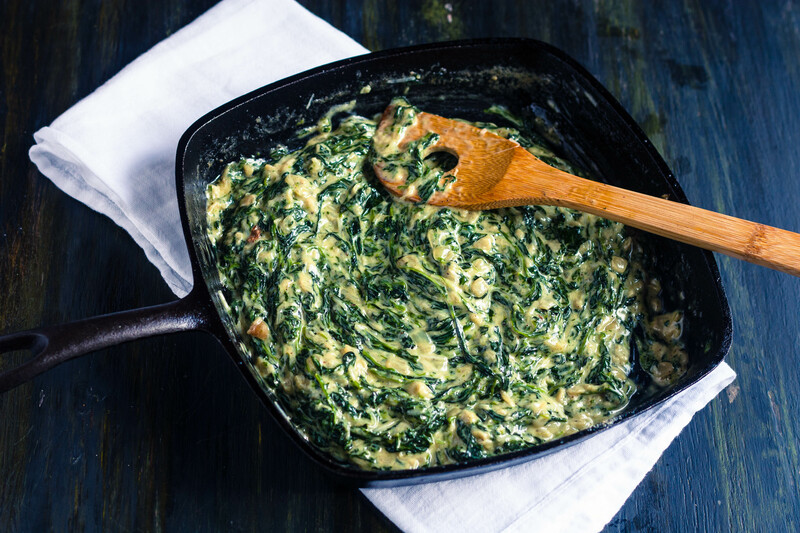 It’s great raw in salads, lightly sautéed, and made into this comforting, rich creamed spinach side dish. This recipe may seem like it uses a ton of spinach, and it does, but as spinach cooks, it wilts down into a fragment of the original volume, so you have to use a lot. If you’re like me, you may have delicious memories of a rich creamed spinach served along side a perfectly grilled prime steak at your favorite steakhouse. Sometimes it’s stuffed into a hulled out tomato then placed on the grill. My sister, June, makes wonderful Spinach and Goat Cheese Stuffed Tomatoes that use a creamed spinach base. They’re so good! Creamed spinach goes so well with grilled meats. If you want to have that velvety steakhouse side at home, you can! Melt 2 tablespoons butter in a large skillet. Stir in sliced green onions and saute over medium-high heat for about 1 minute. Begin adding the spinach a handful at a time, stirring to wilt the spinach. Continue adding spinach and sautéing until all of the spinach has been used. Place spinach mixture in a colander and press as much liquid out of the spinach as you can. Place pan back on the heat and add remaining butter. Stir in minced garlic and saute over medium heat for about 1 minute, making sure not to burn. Immediately add the cream and nutmeg and cook over medium-high heat, stirring often, until the cream reduces into a thickened sauce, about 5 minutes. Add spinach into the reduced cream and cook for an additional 3 minutes, stirring often. Remove pan from heat and stir in cheese mixture. Season with salt and pepper to taste and serve immediately. A delicious addition to this side dish is fried bacon pieces! JenniferCooks is now a Yummly publisher! I just joined Yummly as a publisher. Yummly is a great place to discover new recipes and allows you to bookmark your favorite recipes right on the site. You’ll notice my Yum button or the “Y” button at the bottom of every post. Once you’ve created a free account, simply click the Yum button at the bottom of my recipes to put them right in your recipe box on Yummly…simple!